Republican senator John McCain has criticised the Pentagon study on repealing the ban on out gay troops and said repeal is “premature”. Mr McCain, who is against repeal, said that the study was flawed because it looked at how the law could be repealed, instead of whether doing so would benefit the military. The research, released on Tuesday, found that most troops were comfortable with the ban being repealed. Authors Jeh C Johnson, the Pentagon’s chief counsel, and Gen Carter F Ham, the commander of the US Army in Europe, said that effective leadership would be enough to tackle “some limited and isolated disruption to unit cohesion and retention”. However, nearly 60 per cent of troops in the most dangerous roles – in the Marines and combat units – said repealing the law would be damaging. Giving evidence to a Senate hearing today, Mr McCain cited this figure. He said “I am not saying this law should never change”, but added that he believed repeal now would be “premature”. “At this time, we should be inherently cautious about making any changes that would affect our military, and what changes we do make should be the product of careful and deliberate consideration,” he said. 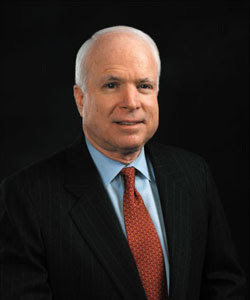 Mr McCain recently blocked a debate of the policy on the Senate floor. Meanwhile, Adm. Mike Mullen, the military’s top uniformed officer, spoke in favour of repealing the ban. Senate majority leader Harry Reid hopes to have a vote on the Defence Authorisation Bill in the next few weeks, which has a repeal measure attached to it.